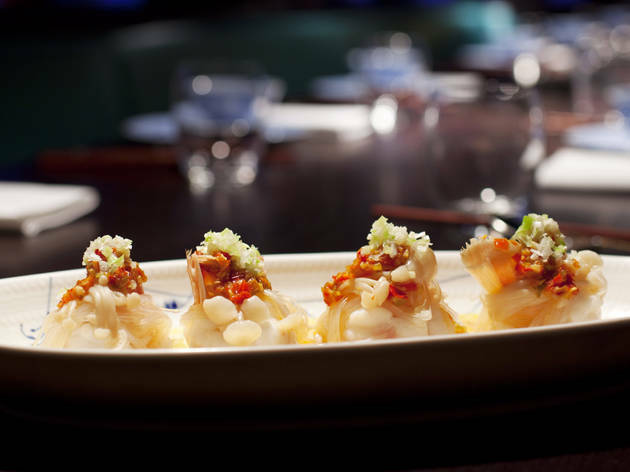 With its stylish interior and innovative Cantonese cooking, Hakkasan is still the benchmark against which all high-end Chinese restaurants should be judged. 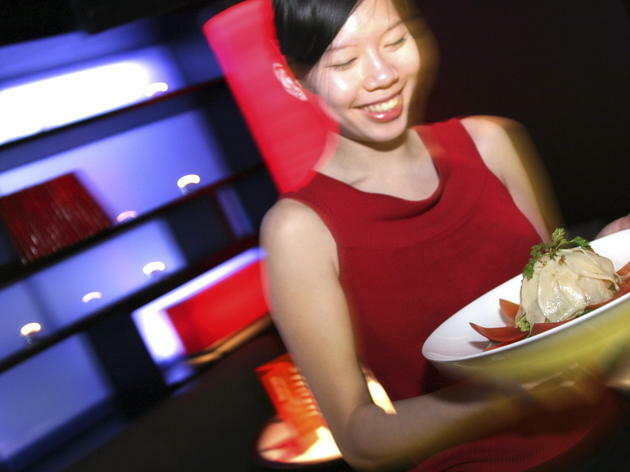 More than a decade after it started wowing London’s big spenders with its classy Cantonese cooking, this Michelin-starred trendsetter remains a benchmark against which all high-end Chinese restaurants should be judged. The basement’s stylish interior (all dark wood lattice screens and moody lighting) still attracts the kind of beautiful people who might suppress their appetites – though there was little evidence of restraint on our midweek night visit. Plate after plate landed on tables around us, including signature dishes such as silver cod roasted in champagne, and jasmine tea-smoked organic pork ribs. We started with the dim sum platter, a basket of superbly crafted dumplings. The pastry was perfect in give and texture, just elastic enough to encase generous bites of flavour-packed meat and seafood. Sweet and sour Duke of Berkshire pork with pomegranate was equally good, the melting tenderness of top-quality meat turning the clichéd staple into a luxury – Chinese takeaways should weep with shame. Drinks run from cocktails via high-priced wines to specialist teas. The original Hakkasan that spawned a global empire (including a newer branch in Mayfair) retains all its appeal: cool enough to be seen in, yet authentic enough to dash pretension. Good restaurant, excellent service, good food but possibly not worth the expense. Wow, I was unimpressed, the prices were so expensive! What you're paying for is the pretence of exclusivity - the food is reasonably tasty but I'd really rather go somewhere less fancy and pay significantly less. There wasn't anything on the menu that you couldn't get elsewhere, although it kind of highlights that the menu is quite authentic and hasn't been significantly altered. The problem for me was that we were really crammed in next to the other tables and the restaurant was too dark for my liking. When you're looking for a really special evening out and you're paying over £50 for some dishes, I want to be able to see what I'm eating and I don't want to be sitting so close to the next table that I could eat off their table without stretching. 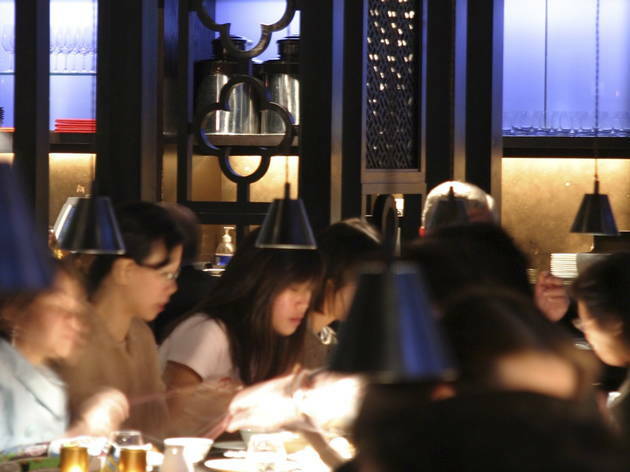 I recently ate at Hakkasan for the first time in about 3 years and I can't help but feel that the standard has either slipped or the London restaurant scene has simply overtaken what was once a standout. I was there with my boyfriend, celebrating a special occasion so we went for the Signature Menu. The value (£130 pp) would have been good enough for generous portions of wagyu, caviar and lobster but the food was mediocre. I can't remember any of the dishes being a standout and 2 of them (the cod in some sort of orangey glaze and one of the deserts) remained virtually untouched as they were frankly not very good. The atmosphere however is still great, cocktails are delicious and Hakkasan's popularity clearly hasn't waned as the restaurant was packed. Service was friendly, but a bit clumsy. They forgot our drink order and then brought us the wrong cocktail. 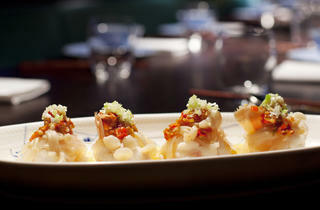 I'll probably wind up visiting Hakkasan again as I feel nostalgic for what was once my favourite restaurant in London. But at over £300 for dinner with cocktails, I feel like I could have spent my money somewhere with better food and service. We booked the Taste of Hakassan dining experience and were really looking forward to tasting the Michelin star worthy menu. My friends and I were really excited and had high expectations, and why not? It's a sister brand of the Michelin Star winner Hakassan Mayfair, so what could go wrong? Apart from the food, everything. While trying to give the venue an intimate feel, Hakassan Fitzrovia comes across a bit tried-hard and borderline dark and dingy. The service is extremely clunky with water glasses left empty, requests for extra condiments left unattended and waiters reaching over you to pick things up from the table. I understand that we got a bargain with Taste of Hakassan set menu that gave us 3-courses with a cocktail for £38+service. However, if I had to pay a la carte prices, I will be looking for an option to give the place negative stars. Going back to the food one more time, the food was delicious, very well executed and satisfying portions. However, this place needs to work a lot harder to live up to it's brand. I was thoroughly unimpressed by Hakkasan for several reasons. First off, I wasn't sure if I was entering a club or a restaurant, because the music is already banging in your ears as you descend the long flight of stairs (oh and did I mention the intimidating welcome outside?). I get the hip, cool, dark vibe but the fact that I can hardly see who I am eating with or what, and that in addition I can't hear a word they're saying, just puts me off. The music is so loud that any conversation is basically impossible - we did ask for it to be turned down, but even so it's like yelling at your mates in a club. The food is over-priced and honestly, you could eat better in Chinatown for less. It's style over substance, and although no doubt the food was delicious it didn't leave a lasting impression. A drunk group of women behind us also didn't help the case, they were laughing or screaming (hard to tell) non-stop but the management didn't really do anything about it. So if I'm going to pay this much for food, I'll do it at an enjoyable place. This is a special restaurant and all dishes are made exquisitely. I highly recommend the dim sum selection and the pomegranate glazed Sea Bass. Everything there was just divine. We had a selection of dim sum and everything was perfect. The venison puff was 12 out of 10 :) . They also had a great drink menu and I had cloudy sake for the first time! Great dining experience! Times and it never disappoints. Yes prices are expensive but it's a really nice place for a date. The cocktails were great and the food is absolutely stunning. I love the fried aubergine, dim sum and the chicken that we had. Each dish was served beautifully and service was immaculent. Definitely worth a visit! Lovely experience with great company, good service & tastie food. The tables are a little dark and squashed together but it does have an exclusive feel to it with a nice atmosphere. It wouldn't be my first choice to go again but would happily attend. Also a little on the expensive side, maybe nice to take a date. 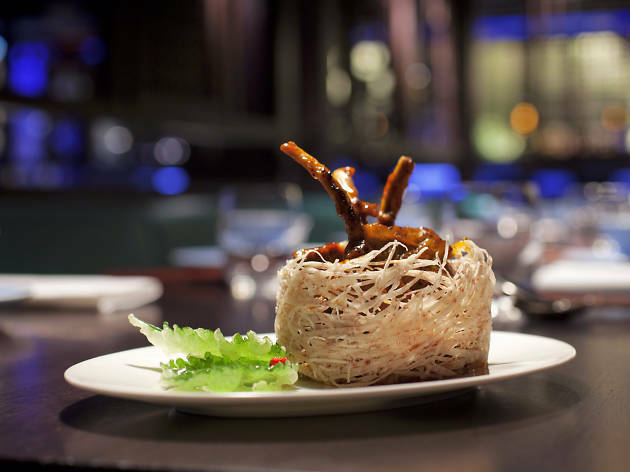 If you love Cantonese fusion, this is the place for you. It's a bit on the pricey side, so go for a special occasion. The ambience inside is great, there's a bar area and the main restaurant. 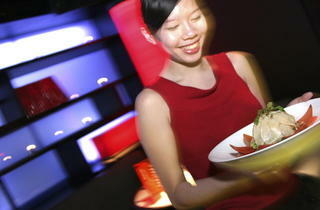 Staff are friendly and attentive to all your needs including food allergies. Here is some of the best Meats I have tried, I recommend the beef and the pork. Top tip Try a Hakka cocktail it's amazing! If you want to eat dinner in a Bond villain’s lair, this is the closest you can come to achieving that in London. The interiors are really impressive (even if it makes it impossible to find the toilets). The food itself is impressive but not cheap. The set menus offer a great way to sample a wide range of dishes — all full of flavour. Special should out to the caviar-topped duck pancakes, which are ludicrously good. There is an excellent selection of wines, but again make sure you’re prepared for your credit card to take a bashing. The service is good, but as you only have a two hour window, it can feel rushed. Overall, a good restaurant for a special occasion — with delicious food and stunning surroundings. 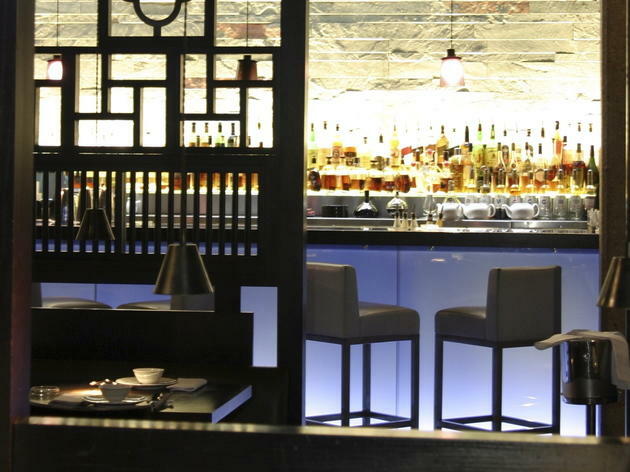 With dark, atmospheric lighting, incense clouds hanging in the air and super slick staff walking in between the beautiful sliding dividers, from the moment you walk into Hakkasan, you are aware that style is at the essence of this restaurant just off Hanway Place. But is it purely style over substance? Thankfully its Michelin star assures you that this place takes Chinese food seriously and the results are simply stunning. The four of us were slightly overwhelmed by the menu- it is extensive and everything sounds so delicious it can send you into a FOMO panic. But we opted for four of their signature menus which allowed us to taste the best that the chefs had to offer. There are expensive (the signature menus range from £65-£128 per person) but we were astounded with how much food was brought to the table; dish after beautiful dish. It is hard to pick a stand-out dish as all were cooked with such technique and were bursting with flavours both subtle and powerful. The venison was a wonderful surprise, very rich and tender and the roasted cod in champagne sauce was melt-in-your mouth and irresistibly good. We started with fresh dim sum and a variety of deep fried goodies; this is a far cry from the stodgy dumplings and greasy popcorn chicken from your local takeaway. Fresh, crispy and delicate; the starters held their own. With a bar that seems to stretch as far as the eye can see, you know that some inventive concoctions will be on offer and Hakkasan doesn't disappoint. Both the lychee martinis and the Kowloon Cooler (a mocktail) looked gorgeous and tasted just as good. This is a special occasion place, maybe book on your pay day as this will break the bank. But the service, the decor and the food (my god, the food) for once do justify the heavy bill. I am already starting a crowdfund to afford my next visit. Well what can you say about Hakkasan apart from just outstanding food. The dims menu here is out of this world and the mains are not far behind. 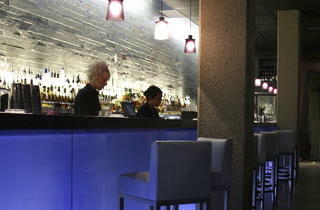 The interior in Hakkasan is very feng shui and relaxed. It can make you stay there a lot longer than you actually had planned which can be dangerous as the food is so good. The rest you will be bale to discover for your self. I have been to Hakkasan a couple of times and each time had to have the aromatic duck- it's by far up there with the best of the best! My husband and I went for the chef's menu and every dish was amazingly delicious. Fabulous food & wine as guided by the Sommelier. Very intimate setting, low lighting & dark oriental décor to create the perfect atmosphere over dinner with your loved ones whilst enjoying a special treat. A stalwart favourite for many years. Food and service never disappoint. 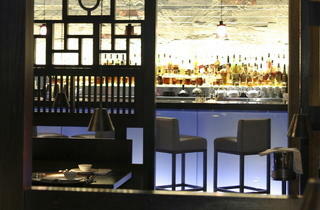 Hakkasan at Hanway Place has a superb atmoshpere whether lunch or dinner. While some of the prices beg the question of is it worth it, then yes for the most. The bar is also a great place to catch up with old friends or work related shenanigans. When my boyfriend told me he had to write a review of this classy, Michelin starred Chinese restaurant, two thoughts popped into my head: free posh food and occasion to dress up. When we got in the shady-looking alley where Hanway place is located, I second-guessed the dressing up but, as we arrived to the door and were greeted by a couple of people with our names on a list, I became really, really happy indeed I had. I don't think I had ever been in such a trendy place. As you walk down towards the restaurant, incense is all around. We were then shown to our table and received tip top service from beginning to end. Every single member of the staff we talked to was friendlier than happy puppy and extremely knowledgable. We were recommended to try the special Chinese new year menu and its matching cocktail and wine. The menu costs no less than £88 which almost made me pass out but I suppose that, if you have this kind of money, it's worth it. This year being the year of the monkey, banana was recurring in most of the dishes and the cocktail. In my opinion, the highlights of the whole meal were the Japanese wagyu beef (starter) and truffle sauce lobster (main): absolutely delicious. I wasn't a big fan of the chicken soup and dim sum at the beginning but that's just a matter of taste. The pieces of decoration that won for me were the immense, fully-stocked bar and the little wishes that the waiters ask every customer to write hung all around the restaurant. Funny moment of the evening: when I bit into the chocolate ball, part of dessert, and the delicious chocolate liquid trapped inside exploded all over my face and hands. A little warning would've been nice but no harm happened in the end. Today's my birthday and last night I was really excited to go to Hakkasan Hanway to celebrate. I had really high expectations - with its reputation and Michelin star an all. But sadly I was ultimately a little disappointed. I was surprised by the illicit speakeasy feeling entrance & the generally dark and closely filled restaurant. We started with a couple of cocktails at the bar (a long and fairly inhospitable corridor at the back) from the extensive and impressive menu. They were good and long and delicious. Mine was intensely lychee flavoured with no hint of alcoholic taste! Once shown to the table we were quickly offered water & helped to order wine, which also came quickly. But actually taking our order seemed to take ages & I noticed the table next to us waited ages for their bill! This aggravated me as later they seemed to rush us through eating. We went for the £65 signature menu & as I love sesame prawn toast, ordered that extra. We were helpfully advised that would be too much and allowed (in good grace) to swap it into our set menu. The food all came quite swiftly and was cleared up v quickly - which given the amount and cost all felt too rushed. There were no little extras - amuse bouches as you normally get in these top end restaurants! The sesame prawn toast were more like little submarines, far too heavy on the prawn and light on the sesame. The dim sum platter had a visually good selection but little variety really - all the same sort of outer and apart from one, the fillings were fairly indistinguishable and they weren't explained. I'd say the much cheaper Mama Lans are better! The mains all arrived pretty much at once apart from one dish that arrived ages later (which I felt had been forgotten) . The food - especially the spicy prawn was delicious and the dishes had a really good variety of flavours. But the presentation wasn't impressive - one dish came on two lettuce leaves. So that really didn't meet my Michelin expectations. There was ALOT of food. I was really put out when we asked if we could take what we couldn't eat home and were flatly refused. The desserts were delicious but again not explained beyond a tarte tatin and a chocolate delice - actually one with apricot layer and apricot frozen yoghurt? Or ice cream? I didn't see the bill (as it was a birthday treat) but apparently a 13.5% non discretionary service charge was added. I hope I don't sound ungrateful - but ultimately I felt though it was lovely it wasn't enough better enough on any front, food, service or atmosphere to warrant the cost so would be unlikely to go back. I'd booked a Saturday night table and was not happy to have to wait for over half an hour for it. We were asked to wait at the bar and I felt like herded cattle in the cramped area. Not an impressive start. On the plus side the cocktails were divine and the food was really very good, albeit over-priced. All in all, the food was good, our waiter was apologetic, but I found it all a little pretentious, and there's plenty of places London that do great food with better service at a lower price. Hakassan should take note and up their game! Having had Hakkasan on my "to do" list for a very long time, I was delighted to find a deal for their summer Ling Ling menu (3 courses and a cocktail for £35). 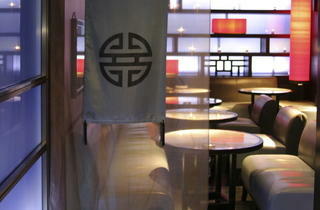 The restaurant offers a great mix of traditional Chinese vibes and contemporary design. The entire Hakkasan experience felt very luxurious and I can highly recommend it. One negative remark was the fact that the cocktail of the pre-set menu could not be altered for a guest who didn't like gin. But hey ... first world problems? PS: Have the macarons! they are insanely good. The food here is difficult to fault. The service is a study in polish. The atmosphere sophisticated (if a bit dark..). However, you have to be sure you want to spend the money on going here - it's pricey. 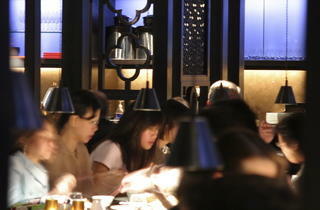 Hakassan Hanway Place is the original one where you want to dine! Excellent fusion Asian cuisine and perfect service! the team delivers a fantastic dining experience and it has been outstanding for the past decade! 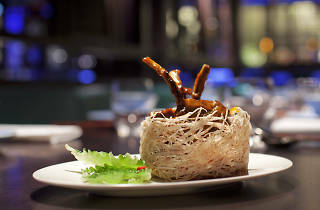 Treat yourself with one of the signature dish:spicy praws, dim sum platter,salt & pepper squids and black pepper beef! The best desert on the menu is The Javara Bomb! Expect an expensive bill, but totally worth it. 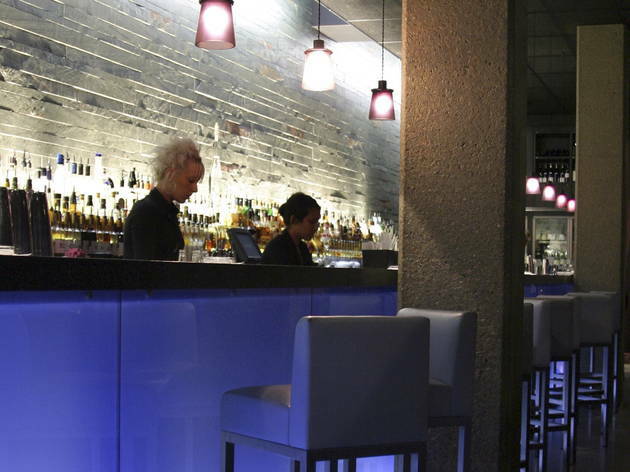 The wine list is long and impressive and the cocktails are certainly one of the best in London (try theKumquat Mojito). 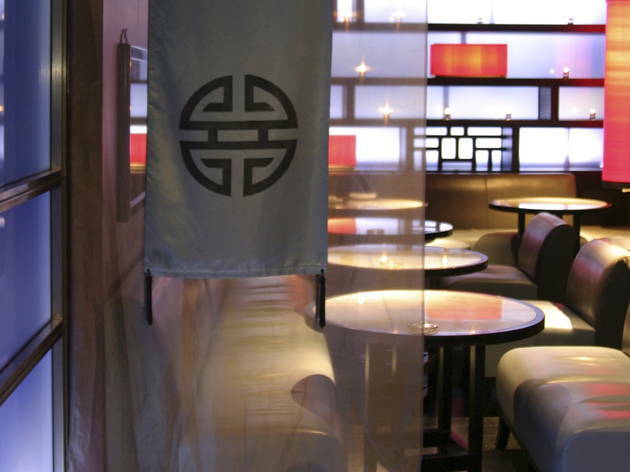 If you want to experience Chinese Michelin star cuisine, this is the place to go in London! Still the best Michelin Star Chinese restaurant in London after a decade...Delicious food, perfect service, 5 starts dining experience! They have a £38 menu offer on booktable until 31st October 2016, a must try! I'm totally shocked at how this restaurant has received such good ratings, reviews and awards - at my first visit earlier this week I found the whole experience utterly disappointing for the cost. I'd wanted to got to Hakkasan for ages, and we finally booked a table earlier this week to celebrate our anniversary. The visit started off well - when we arrived we sat at the bar, and had 2 delicious cocktails; the bar was impressive, the bartender helpful and friendly. The waitress returned several times to ask if we were ready to be seated - we felt a bit hurried but stayed at the bar until ready. When we sat, our table was in a secluded spot, which is what I'd requested so that was good. We ordered the tasting menu at £118 each and it was from there that things went downhill. For a start, the food - it was underwhelming for the cost - it all tasted good, but not better than I've had in other nice restaurants that charge far less extortionate prices. Also the quality of the ingredients wasn't what I'd expect - "lobster" was the inferior Australian rock lobster, and the sea bass was farmed - at that price I'd expect wild. There was a huge amount of food, we couldn't finish, but at the price I'd expect less food but of a higher quality, and for the menu to better complement so it wasn't so 'heavy'. It didn't help that the service was extremely fast - dishes came out one after the other and starter and main blurred together. Twice we sent back dishes to come out later so we could eat the food hot, as dishes were just sat there getting cold - the staff seemed put out when we requested this, as though it was unusual to want to enjoy a leisurely dinner. On top of this we had 5/6 different people serving us through the night, at least 2 of whom didn't speak English well enough to understand our questions about the menu - I'd expect a server and one who knows the menu inside out. In summary the whole experience actually felt really 'commercial' like they wanted us in and out. When the Server that we paid asked about our experience we gave this feedback, he only responded to our comment about fast service, saying that most people want food to come out quickly and together. I'm really shocked at the positive ratings reviews and awards Hakkasan has achieved - it didn't resonate at all with our experience. I wouldn't go back, there are better restaurants, Asian and otherwise, that provide a more high-quality and intimate experience, and better food, for a fraction of the cost. The food and service here are excellent, but I find it slightly too expensive. I took my boyfriend here for his birthday and we loved it. Our waiter was lovely and when he overheard it was my boyfrend's birthday he came over with a cake but asked us if it was ok to light the candle and sing as he didn't want to embarrass us which I thought was a lovely little touch. He also gave him another limoncello for free when he drunkenly knocked his half empty one on the floor! I was expecting it to be really expensive as we didn't hold back and 2 more dishes than recommended but I was pleasantly surprised with a bill of £130! The place is decorated really well too. Would definitely go back.